Covering the nurse’s role in promoting community health, Community/Public Health Nursing, 6th Edition provides a unique ‘upstream’ preventive focus and a strong social justice approach in a concise, easy-to-read text. It shows how you, as a nurse, can take an active role in social action and health policy – especially in caring for diverse and vulnerable population groups. 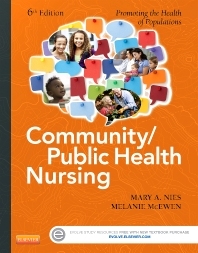 Written by community health nursing experts Mary A. Nies and Melanie McEwen, this book offers clinical examples and photo novellas showing how concepts apply to the real world, and describes the issues and responsibilities of today’s community and public health nursing. UNIQUE! ‘Upstream’ preventive focus addresses factors that are the precursors to poor health in the community, addressing potential health problems before they occur. UNIQUE! Emphasis on community aspects in all steps of the nursing process highlights the community perspective in all health situations. UNIQUE! A ‘social justice’ approach promotes health for all people, including vulnerable populations. UNIQUE! Photo novellas use photographs to tell stories showing real-life clinical scenarios and applications of important community health nursing roles. Research Highlights boxes show the application of research studies to the practice of community nursing. Clinical examples offer snippets of real-life client situations. Case Study: Application of the Nursing Process feature presents practical and manageable examples for the theory, concepts, and application of the nursing process. Ethical Insights boxes highlight ethical issues and concerns that the community/public health nurse may encounter. Objectives, key terms, and chapter outlines at the beginning of every chapter introduce important concepts and terminology.